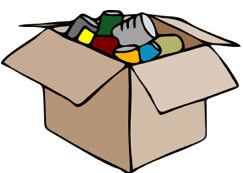 The basement is a place where people put extra stuff when their closets begin to overflow. And too often that extra stuff ends up in a pile down there. It does not have to be this way when there are so many easy storage solutions. The portable closets are basically covered closet organizers. There are many such closets on the market but not all are durable. The Organize It All wardrobe pictured here is very sturdy. The cover is made of canvas fabric with full front zipper for access. It has top and bottom shelves and reinforced bar for hanging clothes (up to 40 pounds). Being on wheels it is easy to move around. 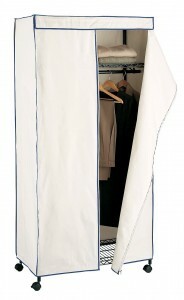 The wardrobe measures 36″W x 18″D x 72.5″H. Similar closet measuring 35.83″W x 17.7″D x 73.2″H is offered by Shop At Clares. You can see all other portable closets on Amazon. When choosing look for sturdy frame and durable cover. If you don’t want to mount shelves on walls the portable shelving units are a great solution. 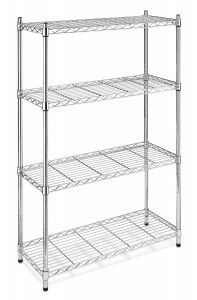 The steel shelving unit pictured here measures 36″W x 14″D x 54″H and has 4 adjustable shelves. It is very easy to assemble without any tools. The structure is stable and each shelf can hold up to 350 pounds. There are also other Whitmor shelves in different configurations. If you are looking for more permanents storage solution the wall-mountable shelving systems by ClosetMaid and Rubbermaid are ideal. They are described in detail under Closet Organization. 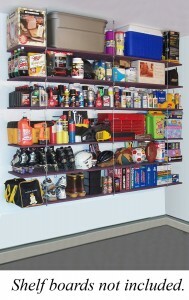 HyLoft also makes powder coated steel shelves in two sizes: 45″ x 15″ and 48″ x 24″. They come in sets of two and each can hold up to 150 pounds. The shelves are easy to install with the included mounting hardware. Just be sure to mount the support brackets on studs. Another neat idea are the overhead storage systems. They are fairly easy to install and reach in low-ceiling basements. 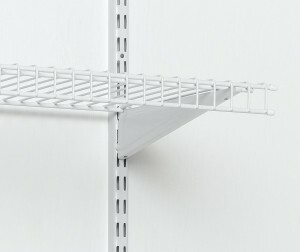 The Quick-Shelf hanger kit pictured here is a variation on the overhead storage idea. 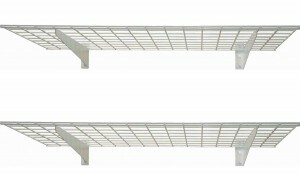 It includes 18 shelve hangers that hang from each other to provide support for six shelves. Once the top shelf hangers are mounted to the ceiling the rest of the hangers go in place in seconds. The boards pictured here are not included; regular 16″ wide plywood or melamine boards from Home Depot or Lowes can be used as shelves. Smaller three shelf wall-mountable Quick-Shelf kit is also available.